The official word is out now. The much awaited car for Indian market in 2013 will be launched in June 2013. 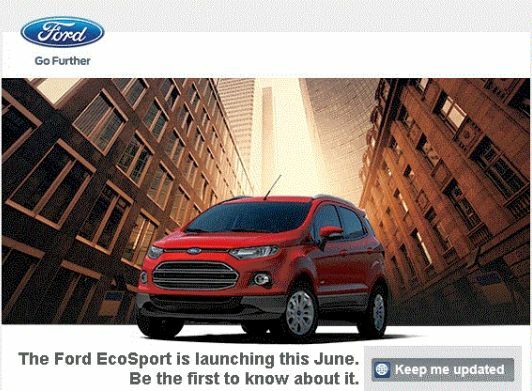 This information has been conveyed by Ford India’s marketing team to everyone who registers for more information on the EcoSport, through a mass email. After successfully completing EcoSport discoveries contest, the bookings will officially open in June accompanied by the launch. The Ford EcoSport was first revealed during Auto Expo in January 2012 and nearly 18 months later, it will be launched here in India. The car will come in four trim variants - Ambiente, Trend, Titanium and Titanium optional. Details regarding the features offered in each variant could be seen here. The car will be launched with three engine options - 1.0L Petrol EcoBoost engine, .15L Petrol engine and 1.5L Diesel engine. There is a huge buzz that the car could be launched at a starting price tag of Rs 6.5 Lac. Ford EcoSport recently crashed during media drive, its safety features were tested. Watch all details here.